G - General Audiences. All Ages Admitted. 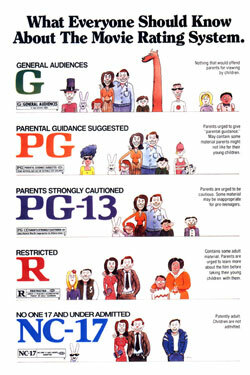 PG - Parental Guidance Suggested. Some Material May Not Be Suitable For Children. PG-13 - Strongly Cautioned. Some Material May Be Inappropriate For Children Under 13. R - Restricted. Children Under 17 Require Accompanying Parent or Adult Guardian. NC-17 - No One 17 and Under Admitted.